On January 14, 2019, Stanley took his last breath on earth to join his beloved wife Betty. 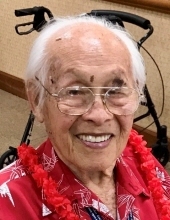 Born in Kohala, Hawaii on December 22, 1921, Stanley led a full life in his 97 years. While just a teen he helped to support his brothers and parents. As a 20-year old civilian employee passing out ammunition, extinguishing fires and helping the wounded the day Pearl Harbor was bombed on December 7, 1941. Stanley married his beloved wife Betty at First Chinese Church, and soon thereafter began raising a family of five children with Betty. Although he did not attend high school or college, Stanley and Betty built an apartment building, the “Tropic Pacific” where their family could live in, and receive income through rent. Stanley also worked hard at multiple jobs (initially a welder and later promoted to Analyst and Operating Engineer at Pearl Harbor, real estate salesman, life insurance salesman) to provide his children with the best education possible at St. Andrew’s Priory, Iolani and Punahou; and just as importantly, orthodontia to make sure his children would not suffer a lifetime of teasing. With his ever-present smile, kind and gentle nature, Stanley was well liked by many. Early in his life he enjoyed ballroom dancing and singing with his guitar or ukulele and hunting in the Koolaus. As a young man, Stanley took a cross-country trip throughout the United States with his older brother, Yung Fook (David). In addition to working three jobs, parenting five children, Stanley was president of two Chinese Fraternal Brotherhoods, Ket On Society and Chee Kung Tong. After his children were grown, Stanley and Betty traveled the world over to such places as Morocco, China, Gibraltar, Russia, Egypt, Australia, England, and Korea. In his twilight years after Betty passed away on November 22, 2011, Stanley continued to be active, driving his car until his 90s (much to the dismay of his children) to Ala Moana Center, City Mill, and other favorite haunts. In his later years, Stanley was famous for wearing his bright floral aloha jackets—many people would ask him if he was once a famous Waikiki entertainer. Stanley was always interested in the latest gadgets and technology, purchasing one of the first calculators, the Bowman Calculator, at Sears when it came out in the early 70s, to purchasing an ipad and hybrid electric suv when he was in his late 80s. Like his father, Chong Seu, Stanley was mechanically gifted and loved to tinker and repair classic automobiles like his infamous ’67 Mercedes that seemed to be on repair blocks for years in the front garage of the Tropic Pacific. His repair skills as a plumber, electrician carpenter and mason were best used in maintaining Tropic Pacific. In addition to his infectious smile and Mr. Aloha personality, Stanley will be most remembered as a family man who sacrificed his own needs for his family, whether it was forgoing a high school scholarship at the then prestigious Lahainaluna HS in order to support his brothers and parents; working all hours of the day to feed and provide the best opportunities for his children’s success. Those who were lucky enough to have known Stanley will sorely miss his bright smile, gentle demeanor, kind spirit, and famous African leopard print jacket. This is especially so for his children and their families whom he leaves behind: Lisa (grandchild Christopher Lee, his wife Tara, and great grandchildren Niko and Ayla; grandchild Chelsea); Lester (wife Lyvonne and grandchildren Landon, Lansen, Larson and great grandchild Myla); Russell (wife Jan); Laureen (husband Philip and grandchildren Larissa, Ian, Lauren); and Leslyn (husband Allan and grandchildren Christian, Carly, Ryan), and brother Chong Fook (wife Akiko). A special thanks to Dina Agnacin who cared for Dad with devotion, kindness, and love until his last breath. No words can ever express the appreciation that Stanley’s children have for Dina. She will remain a valued member of the Leu Family forever. Stanley’s life will be honored and celebrated on February 8, 2019 at the East Chapel of Nuuanu Memorial Park & Mortuary. Viewing is from 9:30-10:30am. Services start at 10:30am with burial to follow at Diamond Head Memorial Park. To send flowers or a remembrance gift to the family of STANLEY TONG FOOK LEU, please visit our Tribute Store. "Email Address" would like to share the life celebration of STANLEY TONG FOOK LEU. Click on the "link" to go to share a favorite memory or leave a condolence message for the family.